Proven Winners ColorChoice crowned a 2019 Shrub Madness winner as the world’s only plant bracket competition came to a close for 2019. Based on the college basketball playoffs, the contest is populated with a wide variety of Proven Winners ColorChoice shrubs, which compete throughout the month of March for the chance to be crowned National Champion. Coming from a crowded field of 64 contenders, the competition narrows to the Floral Four, then the final two after multiple rounds of voting. This year’s Floral Four included Pugster Blue Buddleia, Let’s Dance Rhythmic Blue bigleaf hydrangea, Suñorita rose, and Tuff Stuff Ah-Ha mountain hydrangea. The last round of voting found Tuff Stuff Ah-Ha hydrangea with a slim lead over challenger Suñorita rose, but it steadily gained traction. In the final few hours of the competition the hardy hydrangea soundly defeated the rose and was ultimately crowned the 2019 Shrub Madness National Champion. 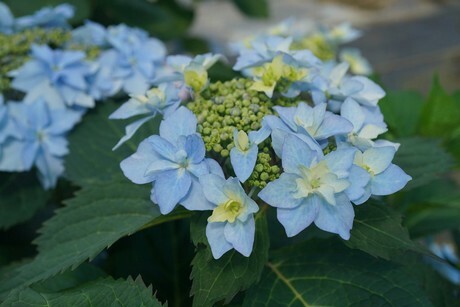 Brand new to garden centers in 2019, Tuff Stuff Ah-Ha mountain hydrangea has big, waterlily-like double florets. It's also a prolific reblooming hydrangea. All summer long, it devotes its energies to creating flower buds on its new growth so that there is a constant supply of fabulous blooms from early summer through frost. "Shrub Madness is the perfect vehicle to find out first-hand what shrubs are most interesting gardeners this year”, said PR specialist Natalie Carmolli. “It’s also a great way to spur some interest in newer varieties." The competition also gives folks at Proven Winners ColorChoice an opportunity to challenge internal preconceived notions about which plants might be most popular with the public. The additional information that is gained as a result of the contest helps to inform marketing decisions going forward. When asked if the contest seems to be gaining traction, Spring Meadow horticulturist Stacey Hirvela said, "This has been a fantastic year for Shrub Madness. We continue to have thousands participants and hundreds of thousands of votes. There’s simply no better, more cost-effective way to bring attention to so many plants." 2019-01-10 "Fall-planted perennials can result in a better quality finished product"
2018-12-04 "SunPatiens really are the Power Flower"